Candidates Want To Raise The Economic Tide To Lift Opportunity, But How? Both Hillary Clinton and Donald Trump talk about increasing opportunities for coming generations. Some analysts say boosting economic growth would help, but the way there is complicated. 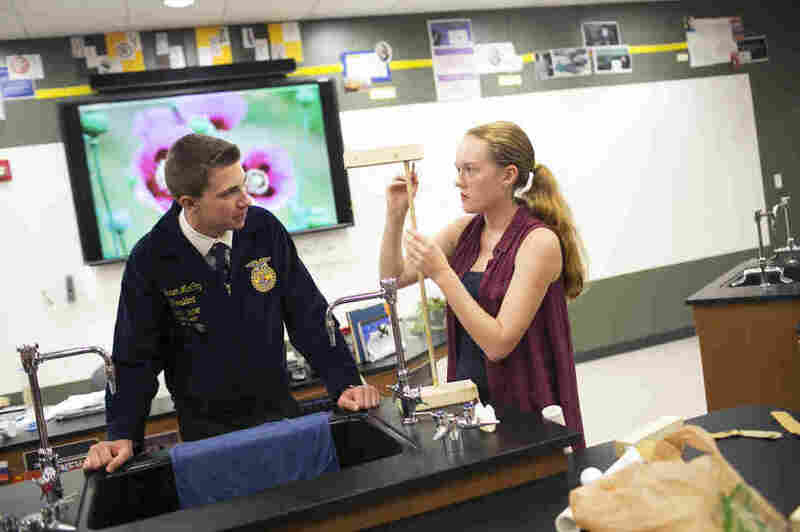 Coleson McCoy watches Heather Milliron work on a project in advanced physical science at the Global Impact STEM Academy in Springfield, Ohio. The city, which lost jobs as factories closed, is trying to boost local incomes with education. The number of Americans who believe their children will have an equal shot at getting ahead in life has fallen in the past decade. Both Hillary Clinton and Donald Trump have talked about economic opportunity in this year's presidential campaign, but they're doing it in very different ways. The notion of the level playing field is fundamental to the way Americans see themselves. And both Trump and Clinton say the country right now is falling short of that goal. "We need to grow the economy and we need to make it fairer," Clinton said in a speech in Michigan last month. "The tide is not rising fast enough, and it is certainly not lifting all boats. Since the crash, too many of the gains have gone to the top one percent." To Mike Schmidt, senior adviser to her campaign, the principle of opportunity for all is suffused throughout Clinton's entire vision of American life. "One of the things she's emphasized throughout this campaign, and really throughout her career, has been this notion that she wants every American to live up to his or her God-given potential because she says only then will our country live up to its potential," he says. For example, when Clinton talks about spending more money on public transportation, Schmidt says, she's trying to ensure that more Americans have access to the best-paying jobs. "It's about using infrastructure investment to unlock opportunity for those who currently aren't seeing enough of it," he says. Republicans see dwindling economic opportunity over the past decade as one of Clinton's real vulnerabilities in this year's election. "Hillary's basically saying, I'm going to provide four more years of what we've been doing for the last eight years where we've had two percent growth that's now slowed to one percent growth," says Stephen Moore, a senior fellow in economics at the Heritage Foundation and an adviser to the Trump campaign. The Trump campaign itself did not respond to an interview request for this story. But Trump himself frequently uses rhetoric about economic opportunity in his speeches. He describes a political and financial elite that has rigged the system in its favor and is indifferent to what he calls the country's forgotten men and women. "People who work hard but don't have a voice," Trump said in a speech at the New York Economic Club earlier this month, "I'm running to be their voice and to fight and bring prosperity to every part of this country." Trump's actual economic platform is less detailed than Clinton's, and much of it centers generally around familiar Republican themes — school choice, less regulation and tax cuts to spur business investment and growth. "I don't think there's any question that Donald Trump has a much more promising economic approach to providing more opportunity in this country," Moore says. "Opportunity means you have a job. Opportunity means you get a good education." Like Clinton, Trump has also talked frequently about repairing the country's aging economic infrastructure. In fact, Mark Weisbrot of the Center for Economic and Policy Research, a liberal think tank, says Trump actually wants to spend more money on infrastructure than Clinton. But Weisbrot says that's at odds with the large tax cuts Trump also proposes. "If that's true, then the question is where is he going to get the money, which is fine if he wants to borrow it. But then he also complains about the size of the deficit and the debt," Weisbrot says. Weisbrot says neither candidate has adequately addressed what he sees as one of the underpinnings of opportunity — Federal Reserve policy. If the Fed raises rates this year, it will have an impact on employment. Both Clinton and Trump say they want to ensure that all Americans have an equal shot at getting ahead, Weisbrot says, but without a healthy job market that amounts to little more than rhetoric. Some candidates have been saying that boosting economic opportunity hinges on making the economy grow faster. "A rising tide lifts all boats" has been a staple of U.S. political rhetoric since President Kennedy used the phrase back in 1963. Dean Baker of the Center for Economic and Policy Research says there's a lot to that notion, but "it's not the whole story." He says that even in 2016, boosting the economy's growth rate would do a lot to create jobs and opportunity for most Americans. In the late 1990s, a time when growth was strong, "we got 4 percent unemployment and saw good wage growth up and down the income ladder." It's the only time in the past 40 years that growth was strong enough to reduce income inequality significantly. So how do we get the economy to grow faster? In the 1990s the Fed held off raising interest rates even as unemployment reached historic lows. Baker says today's Fed should heed that lesson. He and other economists, including Susan Helper of Case Western Reserve University, say there's another obvious way to boost growth — spend a big chunk of government money on infrastructure. "We could do that at almost no financing cost because interest rates are so low," Helper says. Right now, the government can borrow money for 10 years at interest rates well below 2 percent. Helper says private industry is held back when government fails to invest in roads, bridges and ports. And spending money that way would give more workers jobs and put upward pressure on wages. "And in the long term it would create infrastructure that allows business to be more efficient and to grow faster," she says. Clinton and Trump both support boosting infrastructure spending. But while faster economic growth is necessary to create jobs and opportunity, Helper says it's not enough to lift everyone's boat. Just look at the booming growth in places like Boston and San Francisco, while some Midwestern cities are struggling. 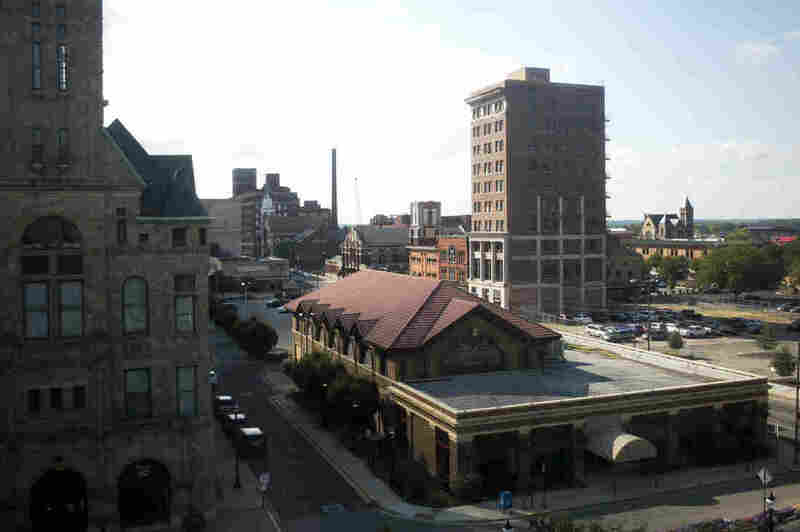 Springfield, Ohio, is attempting a comeback with downtown revitalization. This week, NPR has focused on Springfield, a small Ohio city that once thrived on manufacturing. But for decades it has lost jobs and incomes as factories closed and workers lost jobs. Springfield is attempting a comeback. One strategy is downtown revitalization. Margaret Mattox is in the middle of that. Eight years ago, she and her brother started an upscale restaurant called Seasons. It was a big risk. "I was scared to death," Mattox says. "The night before we opened I thought, 'What if nobody comes? You know, what if nobody shows up?' "
People did show up. The lawyers, bankers, and medical professionals working downtown became regular customers. But Mattox worries there aren't enough of them. "It's a challenge. I think the market is somewhat limited in Springfield of the people who want to pay $12 for a sandwich and a side," she says. Springfield is trying to boost local incomes with education. There's a new public technology and engineering school. Education is important, says Tyler Cowen, an economics professor at George Mason University, but it's not a silver bullet. "You can get a good education, but a lot of tech now changes so quickly that that's rapidly obsolete," Cowen says. "So the question really is, can you retrain yourself very quickly all the time. And the percentage of people who can do that is relatively small." And Cowen says, even getting a decent education in the first place is not a given. "The bottom third of the American system of education is a complete wreck," he says. Cowen says one way to remedy that is vouchers that give parents the option to move their kids to better-performing schools. Baker promotes vouchers for another barrier that many Americans face — finding affordable housing in good communities. "When children grow up in these pockets of severe poverty they're seriously disadvantaged, so if we could allow people, lower-income people to move into middle-income neighborhoods, that's a really good thing to help people at the bottom." Baker says another reason for the widening income gap is that trade agreements have forced U.S. factory workers to compete with workers overseas. Meanwhile, the incomes of U.S. professionals are protected. "We've done little or nothing to make it easy for smart kids from Germany, Japan, Mexico, China to train to our standards and come to the United States and work as a doctor," Baker says. Opening U.S. professions to the same international competition that U.S. factory workers face would lower the costs of services for all Americans, he says. So, there's no shortage of ideas for how to help Americans at the bottom of the income ladder. But Cowen says that despite our political rhetoric, we haven't made it a priority. "All of these changes, they would hurt someone," he says. "We have this myth that we can grow and be dynamic while no one has to lose anything. But some home value must decline. Some people have to live in more integrated neighborhoods, some professions will earn less money as we open them up to competition." But, Cowen says, Americans aren't mentally prepared to face that yet.